Meet Flusha Applebee. 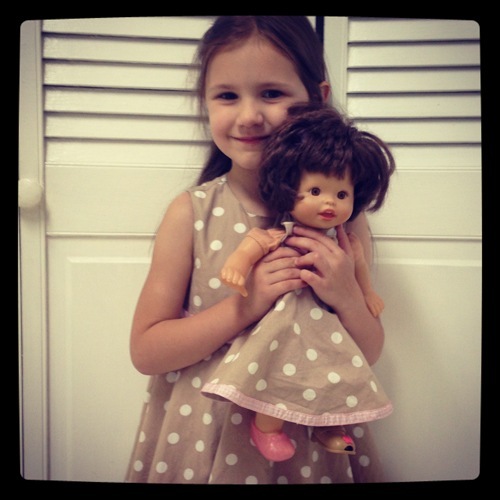 This is Julia’s doll and for a long time had an ordinary name of “dolly”. Julia has settled on the self-created name of Flusha Applebee for the doll. She enjoys making up words at times and this one seems to have stuck. In this case the photo doesn’t tell the story, but some times the story is necessary. Julia has a great imagination. 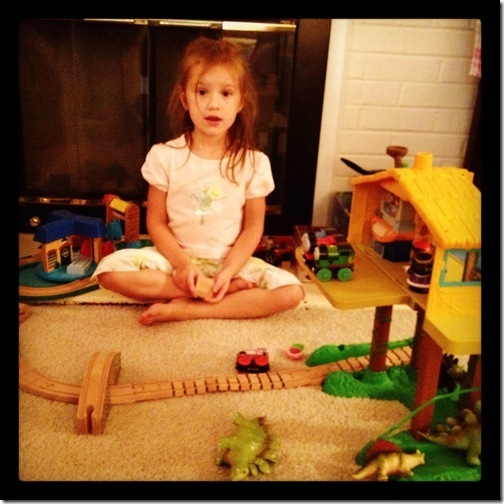 She is always taking toys and repurposing them into new play situations. One activity she loves to do with Robby is to play with his iPad. 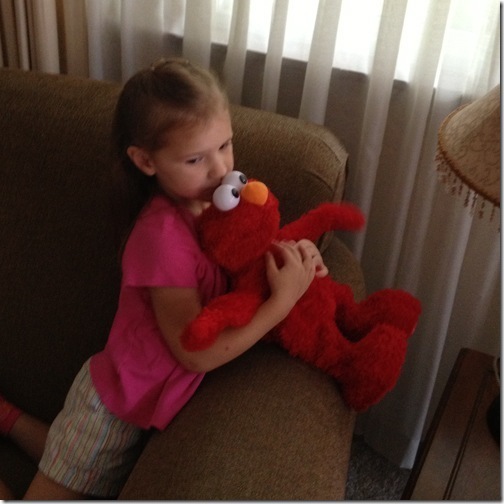 They play Angry Birds together, but also a few educational games she plays on her own. Enough backstory . . .
Julia started carrying her favorite pillow around, which she normally calls "pilly", telling us that it was her pilly iPad. She said, "I’m going to play my new favorite game called Oswald." 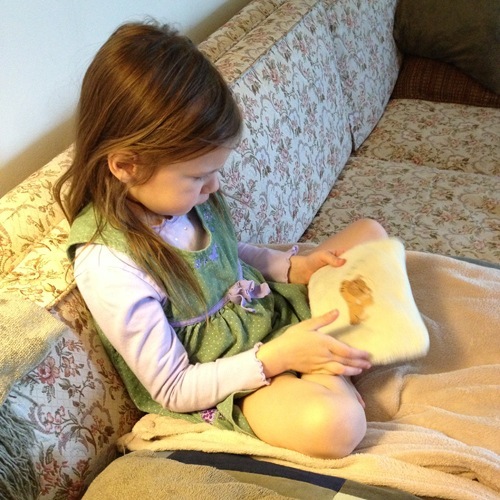 She sat down and started to touch the pillow like it was her own iPad and played a pretend game of Oswald talking to the pillow the whole time. A few days later she borrowed Robby’s iPad screen cover and placed it gently on top of her own pillow. She would remove the cover and play then returning the cover to the top when she was done. Sometimes it is just fun to watch Julia play. And now we know we do not need to buy her an electronic device of her own. She will be quite happy with just her pilly iPad! Meet my little friend Natalie. She was feeling sad one day as she wanted to keep up with the bigger kids, but couldn’t. She asked for help to climb the play structure. 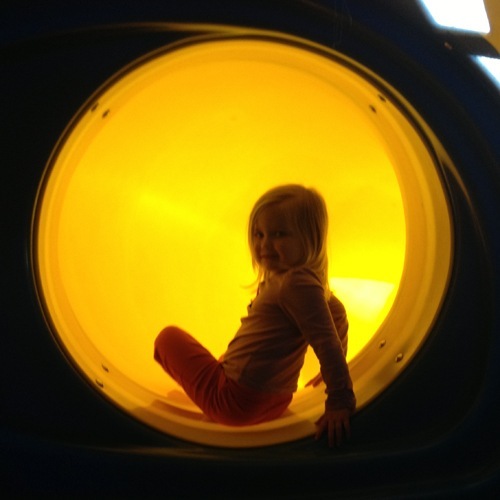 I took pity on her and climbed in the structure to help her get past the tough part. She followed a climbing tip and found out that she could climb the levels all by herself. Thanks Natalie for the grin and letting me help you discover something new about yourself. 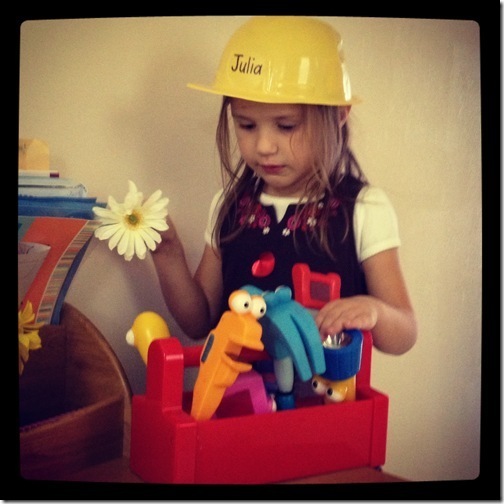 Julia decided to take care of fixing a few things around the house. After a lot of repairs she decide the tools were dusty and took the flower to them for a good cleaning. Kids are the best at making good jokes without meaning to – she told me that Dusty was very dusty and needed to be cleaned. I loved that one! 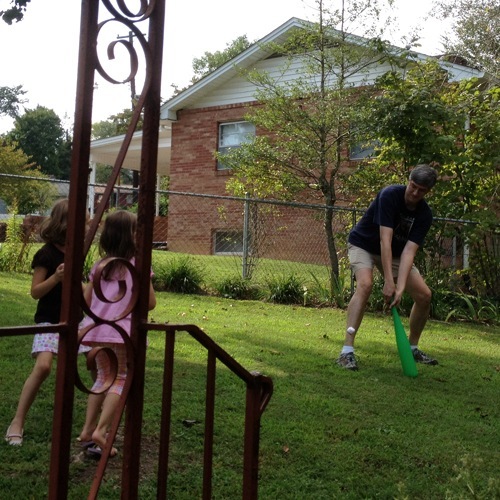 Daddy was playing baseball with his girls after work and school one day. 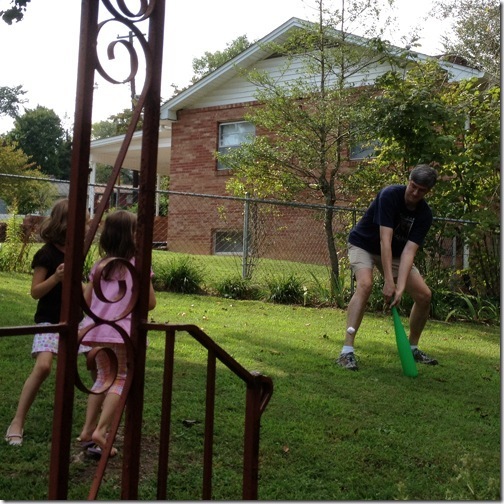 The girls had their turn at hitting, but decided it was Daddy’s turn. Before the photo was taken the ball had to be fetched off the roof twice. Not too bad for hitting a tiny ball thrown by little girls. Julia has missed having Emily around to play with. 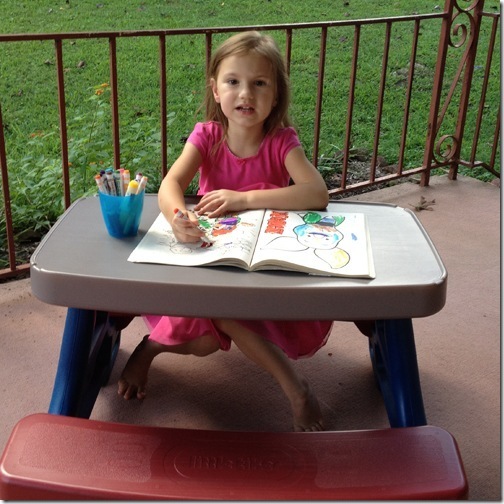 Still, Julia is great at playing by herself and is also enjoying having time with Mama to herself. While much of our time isn’t spent doing "exciting" things, we try to have fun in just the normal moments of life. 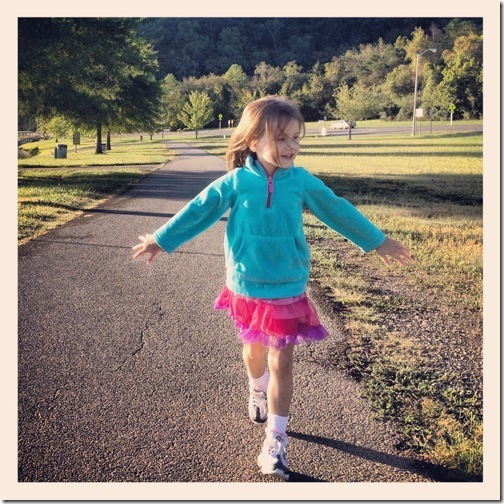 As an exercise Mama has tried to take random photos of the things we do. Here is a selection of our life. Someone blew the bubble and then caught it back. 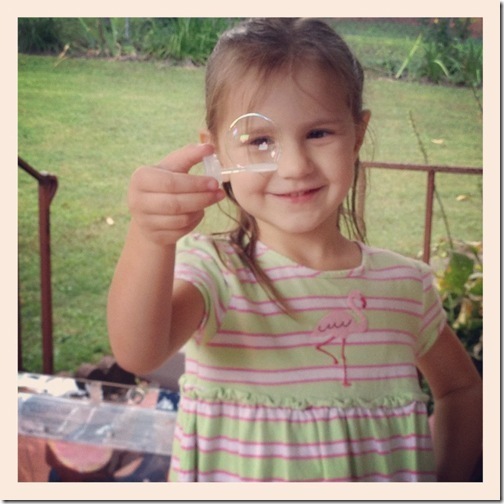 It looks like her fancy magnifying glass. 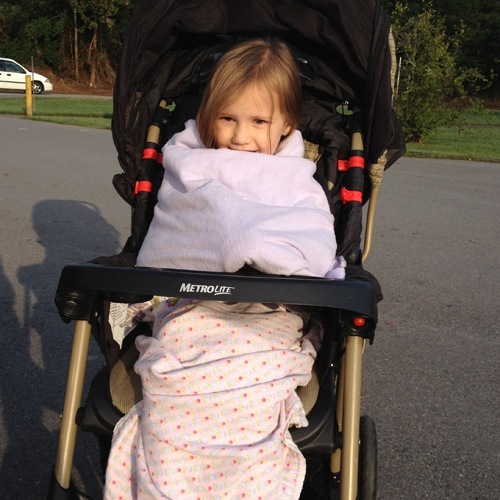 Some of our morning walks are on chilly mornings. 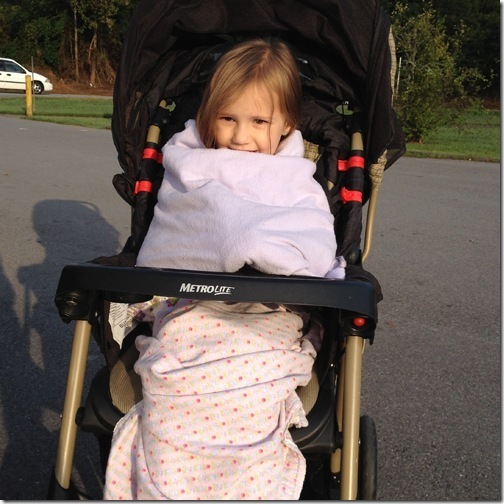 To stay warm Julia prefers blankets to a coat. Who can pass a random bike rack without having to play with it before moving on? 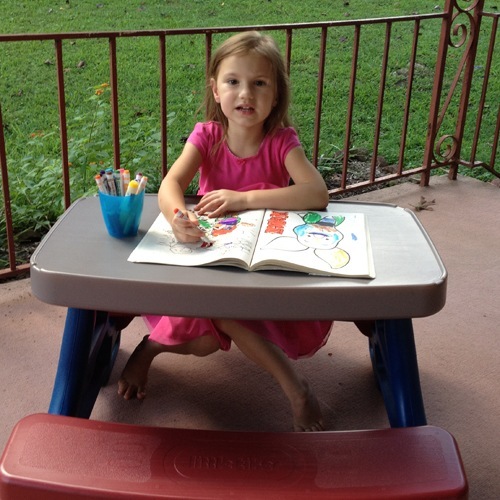 Coloring anywhere is fun, but the front porch is as good as anyplace. When we walk Julia has great smiles to share with others. 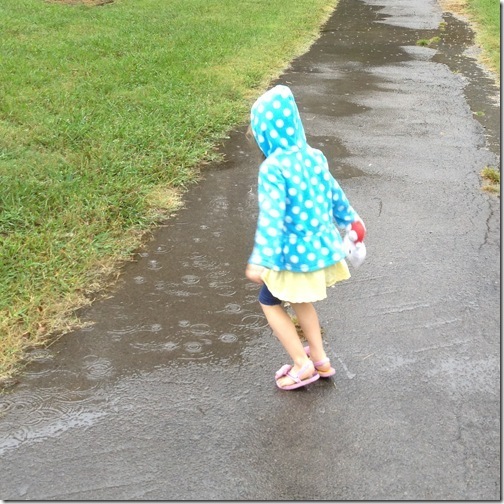 Her favorite song to sing while we walk is "twinkle, twinkle, little star". Just loving and playing with our toys are fun things to do too. 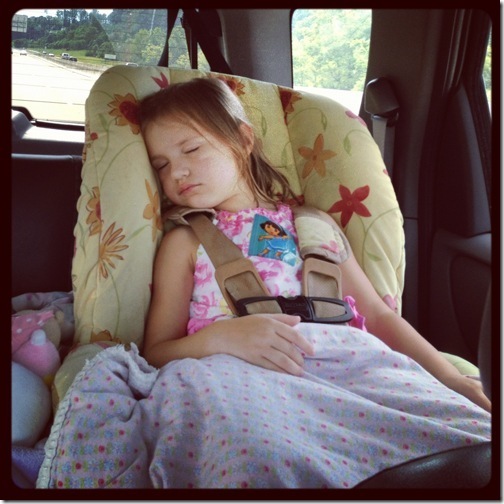 We are on-the-go so long some days that we just give out in the car. This day was really funny because five minutes before this photo was taken, Julia had just informed Mama that she was not tired. Rainy days are great days to jump in random puddles. This one was outside of the preschool. A week can’t go by without some train building. 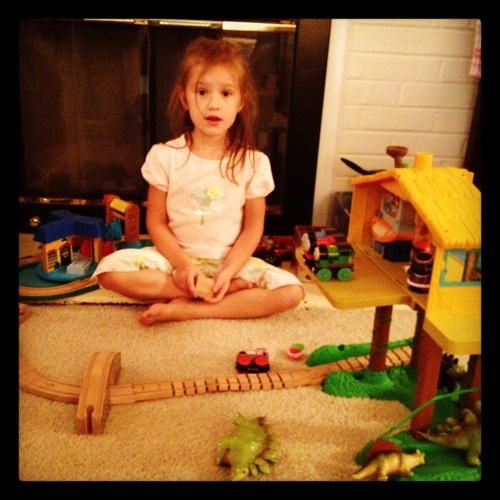 This day she made the Diego house into the train station. The trains are lined up on the porch waiting for their turn on the track. 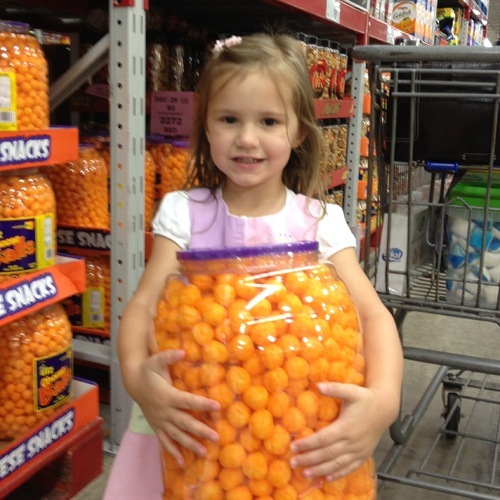 Never underestimate the fun of helping Mama shop at the super-warehouse store. Yes, the cheese puffs are almost as big as she was. 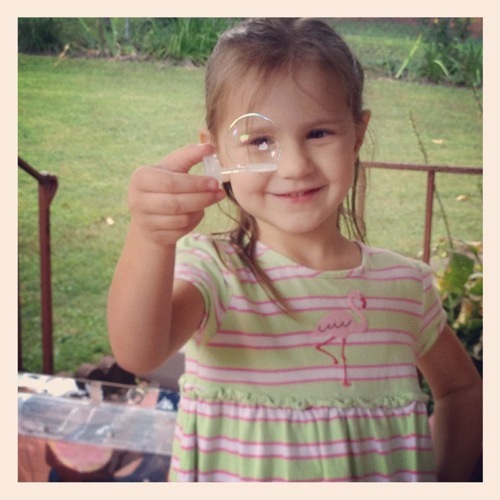 And yes, her Mama bought it because she was so darn cute. Driving the grocery car is always a bonus. 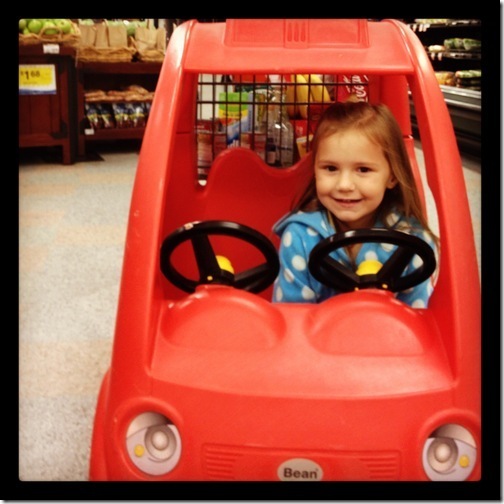 She informed me that she was Milli driving her UmiCar. If you don’t know the reference you have not been watching Team Umizoomi like we do. 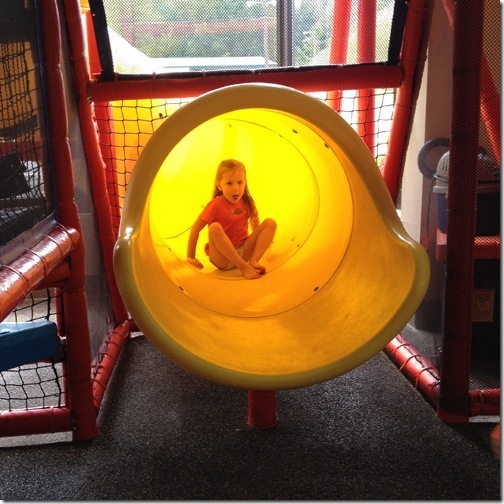 There is always the fun of an after-lunch slide to go down. 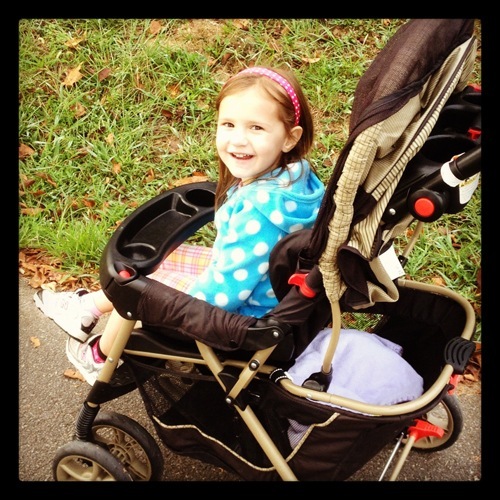 Julia doesn’t always stroller on our walk. 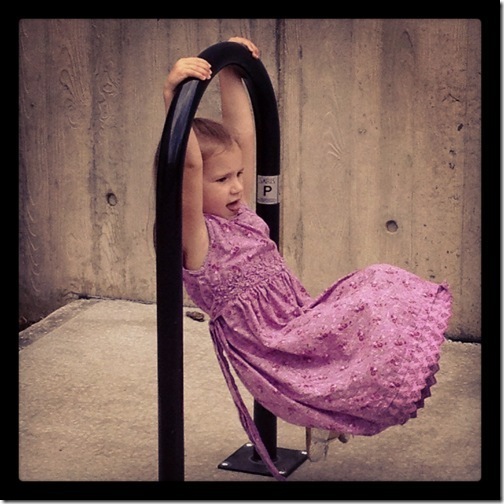 Although it is not so strenuous for Mama, little girls have to stretch their legs too.